SATURDAY, APRIL 6 @ 7:00PM SUNDAY, APRIL 7 @ 1:00PM TICKETS ON SALE TUESDAY, SEPTEMBER 25 @ 10AM TICKET PRICES: $17, $32 and $47 (plus applicable service charges) Tickets available at the Verizon Arena Box office, 800-745-3000 or on line at www.ticketmaster.com. PIT PARTY: Saturday, April 6 @ 4:30pm – 6:00pm Must also have event ticket Pit Passes $15 Pit passes can be purchased at the box office or through Ticketmaster. GROUP SALES: Groups of 9 or more contact the group sales office at 501-975-9131 or by email at jflynn@verizonarena.com. Monster Jam® is adrenaline-charged family entertainment providing jawdropping displays and gravity-defying feats that promises to always leave fans entertained. 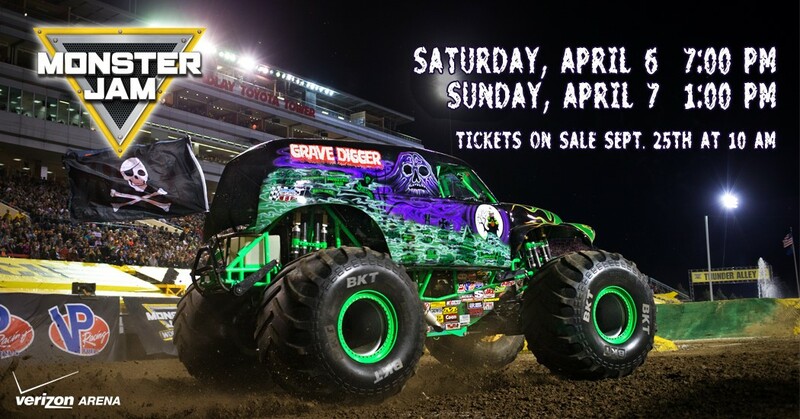 Monster Jam events feature some of the most recognizable trucks in the world including Grave Digger®, Max-D, El Toro Loco® and many more. Our world-class drivers push these perfectly engineered Monster Jam trucks to their limits in Freestyle, “2-Wheel Skills” and Racing competitions that will put families on the edge of their seats and leave them craving more of this unexpected, unscripted and unforgettable event!